Education, education, education… you’ve heard about the importance of a good education all of your life. It’s right up there with buying a house, where location, location, location is the mantra. This article explains what hospitals and health systems are looking for when hiring Nurses and why a BSN degree or higher is important. DiversityNursing.com understands that not everyone has the financial means to continue their education. That is why we continue (7 years/winners so far) to offer our Annual $5,000 Education Award. Please read this article and then register for our 8th Annual $5,000 Education Award below. Megan Goodman was a dean’s list student at Pennsylvania College of Health Sciences who served on two student nursing boards before she earned her associate degree in nursing in May. Since then, the 30-year-old Downingtown, Pa., resident still is seeking work after applying for more than three dozen hospital jobs. “Truthfully, an associate’s program is not really going to get you anywhere anymore,” she said. The trend in nursing mirrors a wider one unfolding in other sectors such as manufacturing and office administration, which are demanding more education and skills than in the past. As the number of job candidates with bachelor’s degrees rose during the recession, due to layoffs and people returning to school, employers began expecting degrees for positions that previously didn’t require them. Such “upskilling” in reaction to a slack labor market was particularly intense in nursing, which saw a flood of new entrants over the past decade. The number of programs of all kinds jumped 41% to 2,270 between 2002 and 2012 amid a widely perceived shortage of nurses, according to a 2014 paper in the journal Nursing Economics. In roughly the same period, the ranks of young registered nurses swelled about 80%, while the number of those over 50 doubled to one million, as would-be retirees stayed on the job. Meanwhile, the Institute of Medicine, an influential independent advisory group, called in 2010 for 80% of the nursing workforce to have bachelor’s degrees by 2020. It based that goal on research dating to the early 2000s showing that hospitals with a higher proportion of nurses with a bachelor’s degree scored higher on important indicators of overall quality of care. “The hospitals said ‘Where do I get the best value, the highest outcomes for the cost? 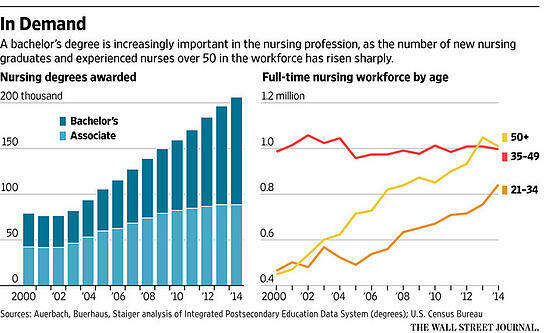 From a baccalaureate nurse,’” said Peter Buerhaus, a nursing economist at Montana State University. At the same time, the Affordable Care Act has put more focus on chronic and preventive care, prompting hospitals to seek more coordination and leadership skills from their nurses—skills that aren’t generally taught as part of associate’s-degree curriculum. A push by hospitals to obtain “Magnet” status, a certification that helps hospitals to recruit and retain nurses, also tilts the field toward bachelor’s-degree holders, since nurses in leadership roles at Magnet hospitals must have a bachelor’s degree. Diana Mason, president of the American Academy of Nursing and a nursing professor at Hunter College in New York, is concerned that hospitals’ increasing preference for nurses with four-year degrees could block what has been seen as a reliable way into the middle class. Some hospital systems, such as Main Line Health in Pennsylvania and Cedars-Sinai in Los Angeles, explicitly require bachelor’s degrees or higher for their nursing residency programs. Hospitals that do hire associate-degree nurses are increasingly putting provisions in their contracts that require completion of a bachelor’s degree within a set period, usually three to five years. Ida Danzey, associate dean of health sciences at Santa Monica College, remembers when the nursing career fair drew local hospitals. Beginning around 2008, their numbers dwindled. Local universities advertising “BSN completion” programs, which allow associate’s-degree graduates to earn their Bachelor of Science in Nursing with additional course work, have taken their place. The extra 18 months or so of education often includes courses in things like leadership, evaluating research and the history of nursing, prompting complaints about unnecessary costs. 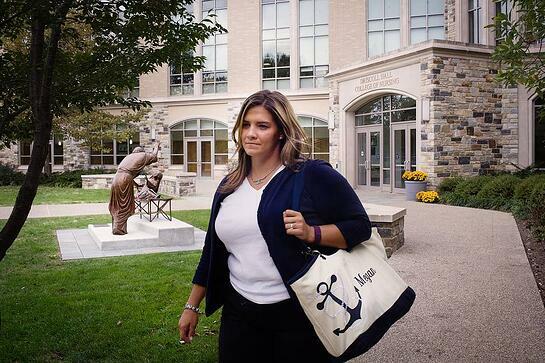 Ms. Goodman, who graduated in May, is already pursuing a bachelor’s degree online through Villanova University as she continues to apply for nursing jobs and works two part-time jobs, as a lifeguard and an emergency medical technician. Looking to hire Nurses? We can help!